BFL n-ply in Countess Ablaze colorway ‘Petrol’. Click for handspun page. I started with a braid of BFL/silk/firestar from Countess Ablaze in a great blue-black colorway called Petrol. I spun the braid from end-to-end into a single that I then navajo-plied for a DK/worsted weight 3-ply. This is the ‘standard’ yarn I tend to produce on my Babe wheel. I love the color and am happy with the finished product, but I really did not enjoy the spin. The fiber was a little compacted (perhaps because it had been sitting in my stash for a year?) and the firestar in the mix gave me a bit of trouble with even drafting. Primarily, though, I think I was unhappy because after spinning on my new Lendrum, I could really feel a difference when I switched back to my old Babe. 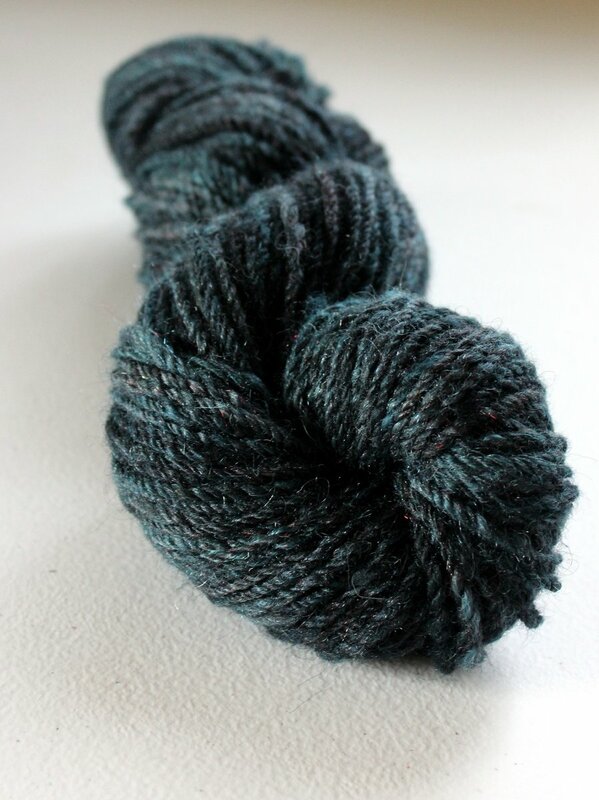 However, I wanted to produce this ‘default’ yarn to go with two other skeins of BFL handspun I had already made on that wheel, so I persevered. Three handspun skeins of BFL. 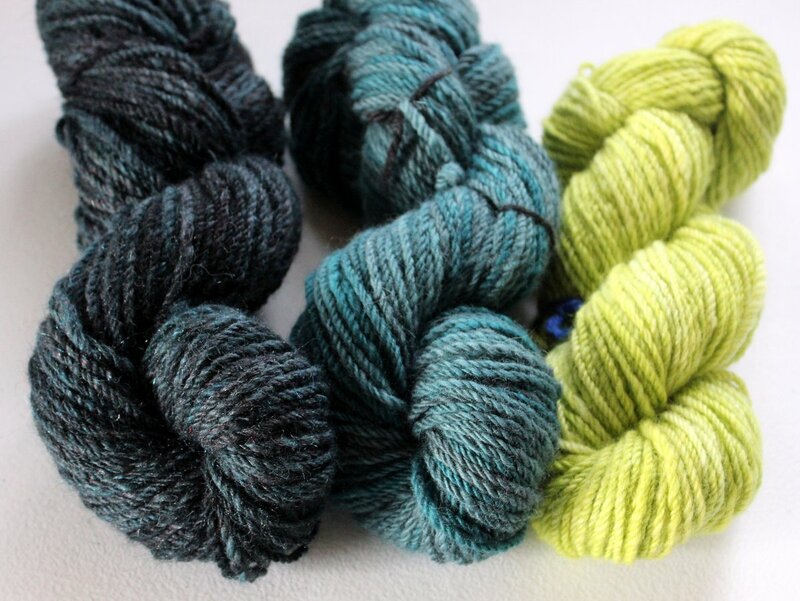 I intend to use the three skeins together, either in a Monster Cowl or as accent colors in some simple colorwork accessories (example hat: Meliorus and mittens: Cloisonee). This skein is probably the last thing I’ll spin on my Babe wheel and I’m happy to have it finished. It was also my entry into the Indie Untangled KAL that just wrapped up. You should check out all the lovely FOs created from indie artists’ materials and patterns, they are really inspiring! Thank you for all of the encouraging comments on my previous post. I hope you’ve had a good start to the new year! This entry was posted in fiber, FO, FOFri, FY, handspun and tagged finishedobject, finishedyarn, handspun, indieuntangled, spinning by shoelaceswitcher. Bookmark the permalink. It is beautiful. I don’t have the desire to learn how to spin, but I am in awe of those who do. Your skeins are gorgeous! I think those three skeins are going to work together nicely! Your spun yarn is so even and beautiful! I am always amazed how beautifully even your spinning is. I think those colors would work beautifully together in Cloisonnee mitts, though it looks like you’ve got quite a bit more yardage than the pattern calls for. Yes, I’d likely use one as the main color and spin up a bit more BFL in a different one (maybe undyed) OR just knit a whole bunch of coordinating accessories. Petrol never looked so good! We fill our cars with petrol not ‘gas’. A very handsome trio too. It may have been unhappy to spin, but I love the color. And paired with the other 2 it’s sure to make a lovely project ! It’s beautiful! I love the subtle colors reflected in it…and I love that yellow/greenish one too! They will look great together!